It's Awards season! No, I'm not talking about the Academy Awards. In fact, I watched almost no movies this past year, and I hated the ones I saw. Not that they were necessarily bad. A mom friend of mine informed me that pregnancy has that effect on movie viewing experiences. Pregnancy and childbirth have been amazing, difficult, sometimes horrific, and always awe-inspiring. After a month as a first-time mom, I am affirmed in the opinion that parenting is greatly undervalued. It's hard work (on call 24 hours a day, on active duty every 2-4 hours around the clock; physically demanding; emotionally exhausting; no pay or expense account) and it's essential to the survival of the human race. I think that's pretty epic. So I have decided to start honoring parents who take good care of their children and also take the time to write, whether they craft novels, review books, or just post on their blogs every once in awhile. To writing moms and dads, goddesses and gods of physical and mental fertility, this is my little offering. Please feel free to snag this award and present it to any Prolific Parent that you know, too. 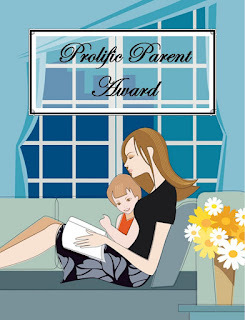 The first Prolific Parent I would like to honor is Sarah Adland, who posts at Growing! and Doing Good Together, a resource for families to better our world and learn through volunteering. Sarah has two beautiful daughters and a baby boy on the way. She also finds time to write creatively and even participate in NaNoWriMo. Great job, Supermom Sarah! I love watching your girls grow up and looking forward to those later years with my daughter. Thank you, thank you, thank you! Couldn't have come at a better time - as I'm nearing 6 months pregnant, feeling like the underside of a muddy boot due to a cold my little generously shared, and still in charge of two energetic, cabin fever-suffering girls. Love the award! And love your blog! Enjoy the next few weeks. Nux's feeding schedule will sloowly spread out (until she hits the 5 month growth spurt!). The hazards of raising children! I forgot to mention the barrage of pathogens on top of everything else. I hope you feel better soon! And I hope you are right about Nux's eating habits. She was in the 30th percentile for weight when she was born, and at her 1-month checkup she was in the 85th percentile. Grow, baby, grow!